If you value the beauty and irregularity of natural stone, we offer ceramic tiles that match the look and feel of the real thing. They're easier to install, clean and maintain- and much more affordable. On walls and floors, you can choose from marbles, granites, limestone, travertine and many more. All virtually impossible to tell from genuine stone. All with the practical benefits of modern ceramics. 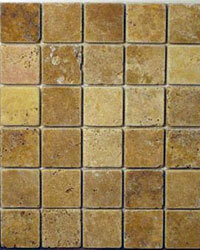 Available in a range of colors and textures, our natural stone mosaics open up a wealth of design possibilities. Stunning when they cover a complete wall, and highly versatile in zones, feature areas, splashbacks and borders. Classic or contemporary. Dramatic or delicate. Our mosaics encourage you to experiment. Made for mixing and matching. To see all of our Naturals products stocked in the United States Warehouse, just click here.